Machine learning on linked data is strongly dependent on the selection of high quality data features to achieve good results and build reusable and generalizable models. In this work, we explore the problem of representing multivalued relations in a suitable form for machine learning while keeping the human comprehensibility of the resulting model. Specifically, we propose the use of a binary vector representation and compare it to two state of the art approaches. 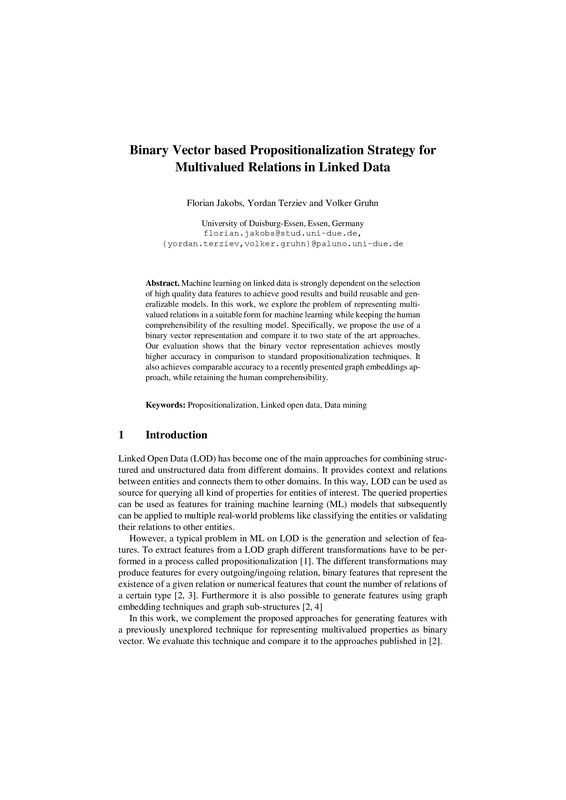 Our evaluation shows that the binary vector representation achieves mostly higher accuracy in comparison to standard propositionalization techniques. It also achieves comparable accuracy to a recently presented graph embeddings approach, while retaining the human comprehensibility.